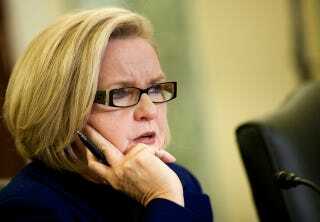 This morning, Missouri Senator Claire McCaskill announced on Twitter that she is "tired of looking and feeling fat. Maybe talking about it publicly will keep me on track as I try to be more disciplined. Off to the gym." Is this a lady thing, or do public struggles with weight loss cross gender lines? Few sentient people would dispute that women, no matter what their role in public life, face a greater social penalty for being "fat." During the presidential campaign, Hillary Clinton's weight was occasionally considered fair game by male and female pundits alike; she later joked at a liberal evangelical forum, "You know, sometimes I say, 'Oh, Lord. Why can't you help me lose weight?" McCaskill's Senate colleague Kirsten Gillibrand post-pregnancy weight loss was a source of immense fascination, including in Vogue, which helpfully added that it would "no doubt" help her "remain attractive to her husband of nine years, who is two years younger than she is." After Gillibrand was reluctant to tell the magazine how much weight she did lose, he said, "The readers of Vogue will want to know this." McCaskill isn't the first person to use the Internet as an accountability tool for weight loss, and going to the gym is a healthier message than say, tweeting calorie counts, whether or not it's an equal opportunity burden.